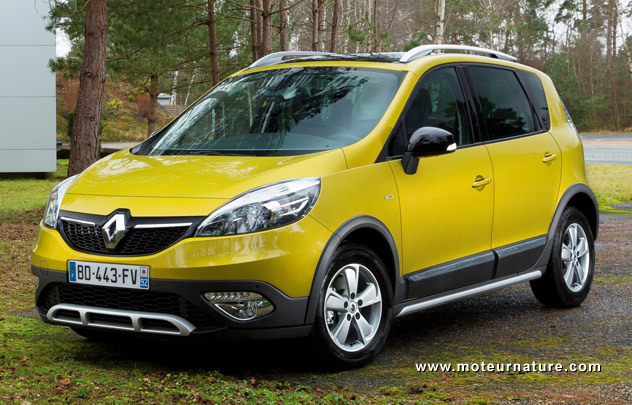 The Renault Scenic has always been a strong seller in France and all over Europe. This is a compact crossover. It has about the same length and width than a Chevrolet Cruze, only taller to gain family credentials. The Scenic has been around for more than 15 years, with Renault’s updating it frequently so that it’s always modern. The latest freshening-up brings a new front end, a larger screen for the navigation system inside but there are also some mechanical improvements which should keep the model class-leading. Our illustrations show the Xmod version, which has a bit of an off-road look. Yet it’s highly unlikely that its drivers will ever attempt to leave the tarmac, so it’s 2-wheel drive only, but Renault gave it a smarter traction control to enhance its abilities. That’s smart! The Scenic will be only marginally better off-road with that simple system, but what’s most important is that it will not be any less fuel-efficient. No weight has been added. This is what counts for most buyers, and Renault knows it so well that it has brought a new super frugal downsized engine under the hood. This will be a 1.2-liter turbocharged inline four delivering 130-hp. Many will find it hard to imagine an engine this small in a vehicle this size, but horsepower and torque values are more of a 1.8-liter engine, so performance should be adequate, if not thrilling. Official fuel economy figures have not been released yet, but we may expect 35 mpg in real world city driving. That is an excellent figure for a trendy family car like this Scenic Xmod. 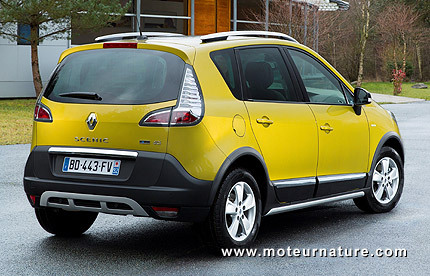 French people will appreciate it, but Renault should consider bringing it to America. This Scenic Xmod would be vastly more efficient than all the competitors there.